A few short years ago I was lucky enough to pay several visits to Napoli in the Campania region of Southern Italy, having friends there. I had some fantastic experiences in that country and visited beautiful, wondrous and interesting places. One incredible experience was when I visited a Serie A football match between Napoli and Roma in the San Paulo stadium in Naples. It was the most incredible experience in and around a football match I’ve had anywhere, and I’ve had one or two of those over the years. We visited some beautiful, wondrous and interesting places. One incredible experience was when I visited a Serie A football match between Napoli and Roma in the San Paulo stadium in Naples. It was the most incredible experience in and around a football match I’ve had anywhere, and I’ve had one or two of those over the years. 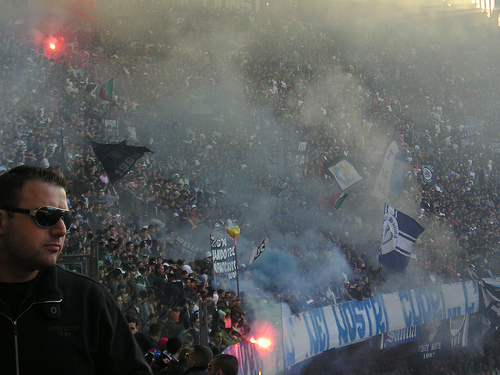 My pal and I were dropped at Pozzuoli metro and travelled along Linea 2 to the daunting San Paulo Stadium, home of SSC Napoli, then (and now again, happily) of Serie A. Picking up a couple of souvenirs of the day, we overheard reports of trouble before the game as we sat sipping cafe alfredos in a cafe bar opposite the stadium. A few minutes prior to kick-off we lined up and picked up the free newspaper from the turnstile, customary at the games, and headed high up in the stand towards our bench seats. The game was a crucial one for both teams. 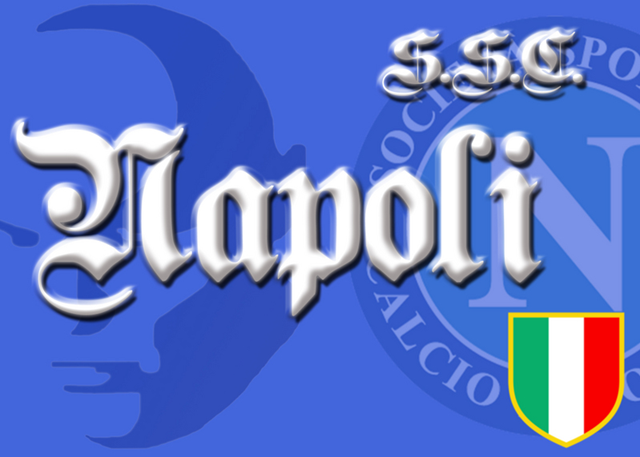 A Napoli defeat would have seen them relegated to Serie B of the Italian League whilst conversely a victory for the men from Rome would have award them the league title. Things, as you can imagine, were extremely tense. Once inside, the San Paulo was just incredible. I’ve been in some very big and impressive sports stadiums in my life but the atmosphere in there was absolutely electric and incredibly passionate and loud. 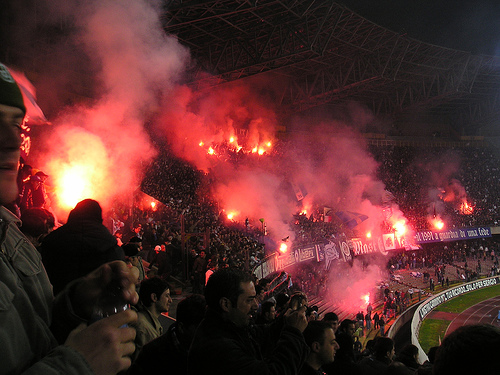 The area where the despised travelling Roma fans were penned in was under almost constant attack by the Napoli boys from before the kick-off. From a distance it was like a scene from the Keystone Kops as each Napoli rush at the segregating fence was replied to with baton charges by the Polizia, repelling them backwards, only for them to regroup and charge again. Napoli were 2-1 down late into the game with the superb Francesco Totti and Gabriel Batistuta pulling the strings for Roma against the plucky Neapolitans. Napoli finally equalised however to make it 2-2 and all hell was let loose. I’d rarely seen scenes like it. Us two Brits were being hugged like we were long-lost brothers, all was well with the world…until we left the ground. Once outside, we quickly saw several police cars ablaze as a riot sparked up in the streets. Me and my pal decided to shelter in a shop doorway as thousands of youths ran amok outside the stadium, running back and forth in pitched battles in the streets. 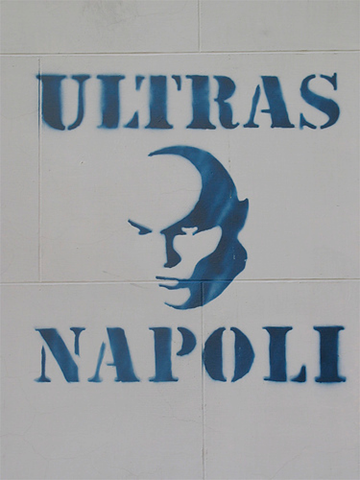 One Napoli fan apparently lost a finger whilst setting off a flair, we heard. We rendezvoused up a quiet lane away from the warfare with another friend and drove the short distance to his home in the attractive Vomero district which sits high above much of Napoli and offers a grandstand view of the city. We sat safely up on his outdoor balcony and watched the rest of the scene unfold whilst sipping cold beers. It was truly spectacular with fires blazing around the San Paulo, and loud explosions at regular intervals. Huge crowds of youths were still charging around the area long after the game, being pursued by a beleaguered and tiring Polizia. Later on in the evening my friend and I caught the funicular in safety down from Vomero and took a walk around the bay in sunny Mergellina to meet our respective partners in Garibaldi Square for food. It was as though we had entered a different world and suddenly the events of the day seemed almost surreal. There was a curt reminder however later that evening when we walked back to the railway station to catch the metro back to Pozzuoli. The Metro station was a site of total devastation, completely trashed. Metro staff were already busily repairing the station like it was just another day, sweeping up glass, repairing woodwork and replacing windows. For a Napoli – Roma clash that’s probably not too far from the truth.